For some weird reason (most likely alcohol-induced) I began scrapping and card making like a woman possessed at the retreat. Although I didn't end up doing that much, I turned out a few layouts and cards that I was happy with. 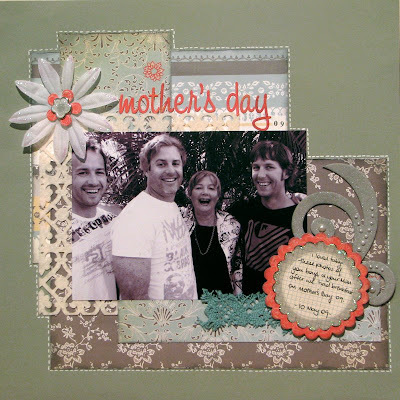 This is Al, his 2 brothers and their Mum on Mother's Day this year. Loved this photo, but Al's hair is looking pretty weird... even he said so!! Al's on the far right. This was my first create for the retreat. I tried mod podging the butterflies from a napkin, but I didn't peel the white layer off underneath, so it showed through a bit. I was still pretty happy with the end result though. Love this pic of Aiden and I on the steps of the cubby. He's such a cuddle pie!! Oh, and there's another one of Leone's famous lollipop flowers! Love them!! Thanks for showing me how to make them, Leone! 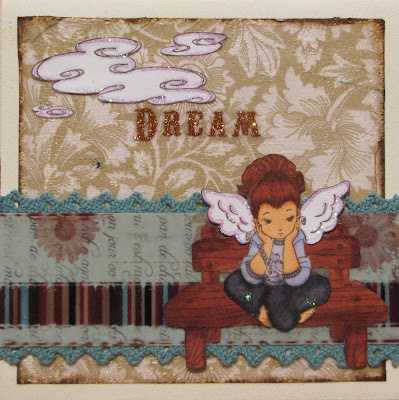 I coloured the gorgeous Whiff of Joy stamp using Simonne's distress inks, and I just adored using them. I never even thought to use them before. Love the soft effect though! I added just a couple of those cute little roses (distressed them, and curled the stems), and they were the perfect addition. 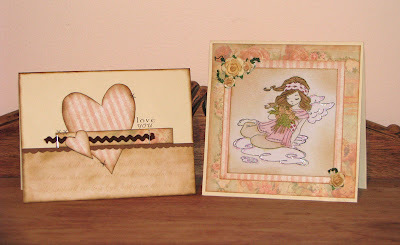 The heart card is from a PageMap sketch. This pic is pretty dark, but these are really bright papers, and look much better in real life. These are the cards I created using some of the other PageMaps sketches. I also made a lollipop flower (thanks to Leone's instructions), and I used Simonne's gorgeous lace Martha Stewart punch!! Love it! 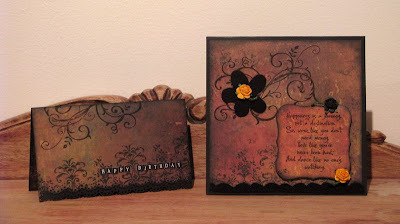 using up some 7gypsies scraps... a gorgeous StampinUp flourish & Martha Stewart lace punch, both courtesy of Simonne (both now on my MUST HAVE list), the gorgeous Prima roses that we ordered through Scrap Pile, and a quote stamp from Helen. Thanks girls for all your little additions to these cards! 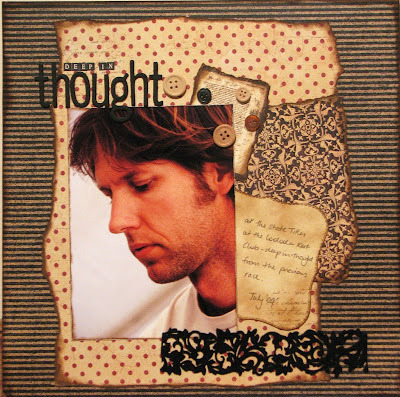 and here's one I made just before I left for the retreat... 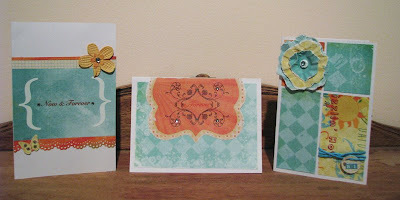 I used copics to colour my new Whiff of Joy stamp that I won in Elisabeth Bell's blog candy! OMG those stamps are gorgeous!!!!! 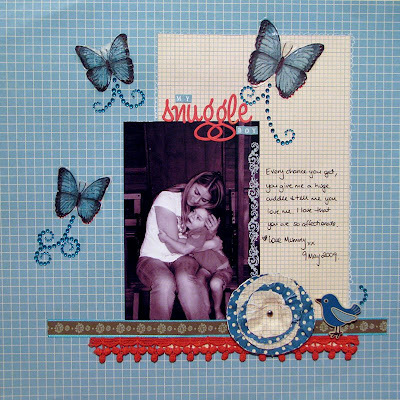 I used a mod podged napkin on transparency (thanks to KarenB), and some kindy glitz on the wings and clouds. Looks like a very productive time spent up there Leah!